Challenged by the need for a major upgrade of your cabling infrastructure? Cisco Quad Small Form-Factor Pluggable (QSFP) bidirectional (BiDi) technology allows zero-cost fiber migration by reusing the current 10-Gbps cabling for 40-Gbps device connectivity. 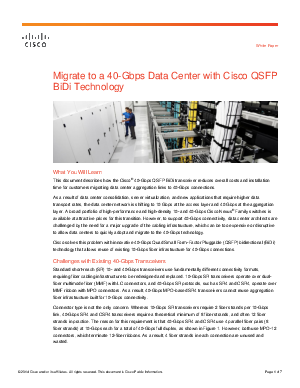 Download our white paper to see how Cisco provides a cost-effective solution for migration from 10-Gbps to 40-Gbps infrastructure.